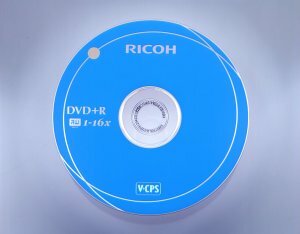 Ricoh Japan has announced that they have started shipping VCPS capable DVD+R media samples to DVD recording hardware manufacturers, as of June 26th. VCPS stands for Video Content Protection System and is a new encryption mechanism designed for use on DVD+R/RW/DL media. The technology was jointly developed by Philips and HP. This system is designed to prevent mass distribution of copyrighted content, which has been recorded from digital TV signals that utilize the upcoming FCC broadcast flag. The implementation of VCPS is not mandated by the DVD+RW Alliance, meaning that there will still be some DVD+R/RW recorders that do not utilize this encryption. However, according to VCPS documentation, DVD+R/RW devices that do not utilize the technology will not be able to record future digital content that is transmitted using the new broadcast flag protection mechanism. A similar technology already exists for DVD-R systems, named CPRM. This technology is already being used in Japan, where consumers are unable to record flagged digital content without the use of CPRM enabled DVD-R/RW media. Source: itmedia.co.jp.